I play with a lot of mobile devices each year. While some are larger than others, a few are so big that they don’t fit in the palm of my hands or even in my messenger bag. I’m talking about electric and plug-in hybrids vehicles, of course — tech which defines mobility not in terms of fitting in my pockets, but in terms of moving me around. Then again, it helps that I’m both a phone enthusiast and a car buff. Since 2010, I’ve covered a wide variety of autos — from Toyota’s Prius plug-in hybrid to the Chevy Spark EV. I’ve tested Ford’s Focus Electric and Fusion Energi. I’ve even driven Tesla’s phenomenal Model S. Today I bring you my take on BMW’s ActiveE, a limited-production electric 1-series coupé that served as a testbed for the company’s i3 city vehicle. Like the Focus Electric, it’s built on a platform that was originally designed to be gasoline-powered. Like Tesla’s Roadster it uses a chassis with a credible sporting pedigree. Still, it slots between these two in terms of price, performance and practicality. Last year, I spent a weekend driving the ActiveE on the hilly streets of San Francisco, across the Golden Gate bridge and on the highways and twisty back-roads of Marin county. Has BMW hit the sweet spot when it comes to making an affordable electric sports car? Is the ActiveE fun to drive? Does the actual range match what’s on the spec sheet? Is the ActiveE the foundation for BMW’s electric future? Join me on a very special road-trip after the break. From a distance, you’d be hard pressed to tell the ActiveE apart from a gasoline-powered 1-series coupé. Get closer and you’ll immediately notice the somewhat tacky decals that adorn the car, which are reminiscent of the traces and pads on a circuit board. My white ActiveE came with silver and blue accents but thankfully, the car’s also available without these decals. Explore further and you’ll notice the lack of exhaust pipe, the BMW M-like hood bulge and the eDRIVE badge. The 1-series is a polarizing design but I think it looks great – the coupé’s proportions are particularly striking. It’s the same story inside: the two-tone black and white interior also features silver and blue circuit board-like accents but it’s more subtle than on the outside and more tastefully done. BMW interiors are usually delightful and this is no exception. Materials and build quality are top notch – my only concern is that white is a difficult color to keep clean. The light grey leather seats are firm and supportive yet comfortable, the steering wheel is thick and meaty and the driving position is excellent. Beyond the circuit board theme, there are few cues that you’re in an electric car. Even the shifter and instruments are almost identical to what you’d find in a gasoline-powered BMW with an automatic transmission. The tachometer and gas gauge give way to charge/eDRIVE and battery level indicators (both analog) and the navigation/infotainment unit includes a few additional screens unique to the ActiveE, but that’s about it. Overall, it’s a simple and elegant driver-focused cockpit, just the way I like it. Popping open the hood reveals a large plastic cover not unlike what you’ll find atop the engine on most luxury cars. What’s more interesting is the Li-Ion battery pack stacked vertically against the firewall, which is the reason behind the aforementioned hood bulge. It turns out that other than radiators and fans (for the A/C and battery heating / cooling) there’s mostly empty space under that large plastic cover. This improves crashworthiness and helps retain that 50/50 weight distribution BMWs are famous for. More battery modules are located in the space usually occupied by the transmission, driveshaft and gas tank. Open the trunk and you’ll notice a rather significant bulge on the floor. This is the only compromise the ActiveE makes in terms of packaging compared to its gasoline-powered sibling. It eats up a few cubic feet of trunk space and hides the transverse-mounted AC synchronous motor as well as the control and charging electronics. While there’s still plenty of room for luggage, there’s no spare tire and that bulge is somewhat unsightly. You’ll find a standard SAE-J1772 charging connector in place of the gas cap on the rear passenger side. Spec-wise, the 32kWh Li-Ion battery takes 4-6 hours to fully charge from a 240V level 2 charging station (8-10 hours using a standard 120V level 1 outlet) for a maximum range of 100 miles. The 125kW electric motor drives the rear wheels – output is 184ft-lb of torque and 170 horsepower, which propels the ActiveE from 0-60mph in 9 seconds with a top speed of 90mph. Curb weight is 4000bs, which is about 650lbs more than the regular model. The car wears Bridgestone Potenza S001 run-flat summer tires (205/50R17 front, 225/45R17 rear). Suspension and brakes are typical BMW, with McPherson struts / vented discs up front and a multilink setup / solid discs in the rear. Of course, the suspension’s been re-tuned to handle the additional weight – as such it makes extensive use of aluminum. Power steering is electrically assisted and feels remarkably well sorted (more on this later). In terms of equipment, the ActiveE includes most of today’s modern amenities. It comes with power windows, locks and mirrors, cruise-control, automatic dual-zone climate control, heated seats and mirrors, GPS navigation with real-time traffic information, satellite and HD radio, Bluetooth, USB, iPhone / iPod integration (30-pin connector) for both media and apps (BMW Apps), telematics (BMW Assist), keyless push-button start, automatic xenon headlights, rain-sensing wipers and ultrasonic parking sensors. Only a sunroof is missing – something I’m rather fond of here in California. 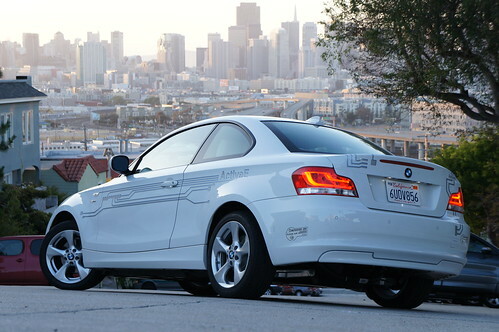 I drove the ActiveE in and around San Francisco for a weekend and came away extremely impressed. There’s often mention of “range anxiety” when discussing electric cars, but I think it’s really just a matter of adjusting one’s expectations. The majority of folks who live in a city or suburb and have a 240V level 2 charging station at home will be able to commute to work and run most of the usual errands, then charge overnight. Charging itself is incredibly cheap (sometimes even free in some locations) and only requires basic planning. Like most people, I don’t have a charging station at home, but I’m lucky enough to live less than two miles from one that’s both public and available 24/7 (Pat’s Garage in San Francisco). Infrastructure matters, and while the Bay Area scores well above average in this regard, there’s still a long, long way to go – many charging stations are located in garages that close at night or have exorbitant parking fees. Not to mention, EVs are currently impractical for interstate travel – at least until DC fast charging, like Tesla offers with its Supercharger network, becomes commonplace at rest areas and service stations. For my review, I decided to drive the ActiveE from lovely Potrero Hill in San Francisco across the majestic Golden Gate bridge to the scenic back roads of the Marin headlands and back. My primary goal wasn’t so much to eke the most miles out of the battery pack as it was to enjoy a pleasant weekend drive with a few spirited jaunts thrown in. My first segment included a mix of leisurely stop-and-go city traffic followed by a stretch of casual highway driving. Once at my destination, I setup my cameras and went through a couple test runs. At this point I’d only used up 28 percent of the battery to travel about 30 miles – in other words, time to forget efficiency and focus on performance. Once behind the wheel of the ActiveE, the first thing you’ll notice is that unmistakable DNA — it drives just like a BMW. The ride is firm yet comfortable and the handling is sharp and nimble. Sure, it feels slightly heavier than its gasoline-powered sibling, especially at the limits, but not in a detrimental way. The battery modules are strategically placed to maintain a low center of gravity and a perfectly balanced 50/50 weight distribution. BMW took great care in fine-tuning the suspension and made sure to fit the ActiveE with summer tires instead of the typical low rolling-resistance rubber found on most EVs. The steering is quick and provides excellent feedback, with none of the vagueness common to many EPS systems – there’s definitely something to be said for dedicating one set of wheels to steering and another set to driving. In most electric cars (and many hybrids), the brake pedal usually triggers both the regenerative and friction brakes. The ratio between the two is computer controlled based on driver’s input — this usually feels strange and disconnected. With the ActiveE, BWM uses a different but highly effective approach: the brake pedal only controls the brakes calipers while lifting off the throttle modulates regenerative braking. This simulates engine braking in a gasoline-powered vehicle – it’s like driving a manual transmission in low gear. While not jarring, lifting off the throttle provides enough deceleration that you don’t always have to use the brakes (in fact, it triggers the brake lights) – ultimately, this provides more control and suits the sporting character of the car. And in case you’re wondering, the brakes are strong and easy to modulate with no hint of fade, even after repeated hard stops. By now you’re probably wondering about acceleration. While the numbers aren’t massively impressive on paper, the ActiveE is no slouch — there’s plenty of power on tap. Unlike gasoline-powered engines, electric motors are capable of delivering maximum torque right from zero rpms. BMW chose to limit the car’s output off the line, presumably to reduce stresses on the drivetrain and the battery. As such, it’s difficult to spin the wheels when launching in the dry, even with the traction control disabled. Once in motion though, the car responds well to throttle input — it’s just not the neck-snapping acceleration I experienced with Tesla’s Model S. There’s also less of a surge in torque at higher speeds (70mph and above). Still, the eDRIVE system compares favorably to the normally aspirated inline six-cylinder engine available in the regular 1-series. With its emphasis on handling over acceleration, the ActiveE is a playful car. Even the stability control system is tuned for performance, letting the rear slip gently before righting things. Of course, all this fun takes its toll on the battery — just like a gasoline-powered vehicle uses more fuel when pushed hard. After several spirited runs up and down canyons, I’d spent another 20 percent of the battery while covering only 12 miles. I decided to grab lunch and coffee in Sausalito while topping off the battery at a public 240V level 2 charging station I located using the ChargePoint app. After being plugged in for an hour I’d regained the 20 percent lost before my break and I continued on to Tiburon to shoot pictures. This was followed by a brief but playful jaunt along the coast and more casual highway driving before I headed back to San Francisco across the Golden Gate bridge. In all, that leg was about 35 miles and I rolled up to my local charging station with 25 percent battery remaining. Not counting the 12 miles of hard driving and my associated one-hour charging break, I used 75 percent of the battery to drive a total of 72 miles – pretty much on par with BMW’s specs. Unlike some of BMW’s models, which use multiple cameras to create a full 360-degree overhead view of the vehicle, the ActiveE makes due with ultrasonic parking sensors. That’s it for driving aids — you’re not going to find any fancy radar / laser-based systems like adaptive cruise control, blind-spot detection, collision / lane departure warning. While some of this tech can be useful, I’m glad BMW decided to concentrate on the core driving experience instead of these complex and expensive gadgets. The ActiveE comes with the latest generation of BMW’s iDrive infotainment system. All the functionality you’d expect is there, including Sirius / XM satellite radio and navigation with real-time traffic, 3D rendering of terrain and buildings. The unit also provides information about eDRIVE, which lets you monitor energy consumption and the state of the battery. It features an 8.8-inch widescreen display and a hockey puck-like controller for navigation. There’s a bit of a learning curve at first – especially compared to most touchscreen-based systems — but the user interface quickly becomes second nature. Most of the important controls, such as audio and climate, also have dedicated hardware knobs and switches. The traditional radio preset buttons can be programmed to perform a variety of functions, such as dialing a favorite contact or navigating to a specific location. If you touch one of those buttons before pressing it, the system will remind you what it’s been programmed to do. Obviously, it’s a completely different experience from the 17-inch touch screen found in Tesla’s Model S, and I prefer the tactile feedback provided by real buttons and knobs. In terms of connectivity there’s Bluetooth for calls and stereo audio, a standard 3.5mm auxiliary input and a USB connector for media devices and iPhones/iPods — the latter using Apple’s legacy iPod control interface. This means the iPhone 5/5c/5s is not currently supported even with a Lightning to 30-pin adapter. Like other BMWs, the ActiveE features an optional SnapIn adapter, a cradle for 30-pin iPhones that provides power, data, cooling (there’s a built-in fan) and a signal repeater connected to the car’s shark-fin antenna on the roof. I’m told that BMW will soon be supporting devices with Lightning connectors on most vehicles manufactured in the past 2-3 years, but it’s unclear if this includes the ActiveE. Besides supplying power and media access, the 30-pin iPhone/iPod interface enables BMW Apps, which allow you to remote control select iOS apps — currently Pandora, Mog, Stitcher and the BMW Connected app — directly from the iDrive interface. The BMW Connected app provides access to your calendar, Facebook and Twitter accounts, plus news (RSS feeds) and web radio right from the ActiveE’s infotainment system — it even supports text-to-speech for calendar entries and status updates. A vehicle finder function transfers location data from the built-in navigation unit to the iPhone, making it easier to find the car after parking. I tried Pandora and the BMW Connected app with an iPhone 4S and it worked just fine — while interacting with iDrive is more cumbersome than using iOS apps directly, it’s also a significantly safer than looking down at the handset’s screen. The ActiveE features BMW Assist telematics, which is also available on some of the company’s other models. When combined with the My BMW Remote app (available for both iOS and Android) you’re able to remotely lock / unlock doors, send location data from Google local search to the vehicle’s navigation system, and recall where you’ve parked. Even more functionality is offered with the ActiveE, including the option to remotely control charging, schedule preconditioning, monitor energy consumption, and find charging stations. Preconditioning lets you adjust the climate control ahead of time and brings the battery pack to its optimal operating temperature while the car is still connected to the grid. Sadly, BMW was unable to give me the login credentials to connect the My BMW Remote app with my test vehicle in time for my review, so instead of getting my take on the telematics experience, you’ll have to contend with some screenshots (below) showing the app in action. I really enjoyed my time with the ActiveE. It’s clear that BMW’s put a lot of attention into converting the gasoline-powered 1-series coupé into a pure electric vehicle without compromising the core driving experience. Make no mistake, this is a proper BMW — a rear-wheel-drive machine with a perfectly balanced 50/50 weight distribution and serious handling chops. On twisty canyon roads, it plays in the same league as Tesla’s Model S while costing significantly less. It’s only when it comes to range and acceleration that it’s beat. That’s not to say that the ActiveE is underpowered or that its range is inadequate — it still fares better in those areas than most other EVs. In terms of luxury and features, the ActiveE matches the Tesla’s Model S. When it comes to practicality, it slots between the hard-core Tesla Roadster and more pedestrian cars like the Nissan Leaf. As I already mentioned, trunk space is somewhat compromised by the bulge hiding the electric motor and there’s no sunroof. Still, those are minor niggles, especially when you consider that, unlike the competition, the ActiveE is not a mass-produced vehicle (total production was 1100 units). What’s more disappointing is that the ActiveE is not for sale — BMW handpicked 700 US-based “Electronauts” in 2011 to lease the car and started delivering vehicles in 2012. This lease — $499 per month for 24 months with a $2250 down payment — was significantly cheaper than what’s available for Tesla’s Model S. Right now, unless you’re one of the lucky few, your only chance to drive an ActiveE is by signing up for BMW’s DriveNow car sharing service. BMW’s always been clear that the ActiveE was developed as a testbed for the company’s i3 city vehicle, but after driving it for a weekend I think there’s room for an affordable electric sports car that splits the cost difference between Tesla’s Model S and Ford’s Focus Electric. It’s a winning formula. Special thanks to Dante Cesa for helping with videos and photos.